Alright so you’re either going to like this one or you’ll hate it. If you like it then props to you. If you hate it then that’s your opinion. You’re allowed to have an opinion, even if I don’t agree with it. I’m a pretty religious guy but I try to keep it to myself if I know that others probably don’t want to hear it. This is a gaming blog and thus is mostly about gaming. However, this is a recommendation post and I can recommend what ever I choose to. I’ve heard a lot throughout the years of how all religious music sounds the same and personally I would tend to agree. I listen to a lot of different types of music and for me it depends more on the artist than the genre on whether I like it or not. Over the years however I have found that not all religious music sounds the same. Some of it is actually really good, in my opinion. Enter into the picture a band named Close Your Eyes that I found a few years back. These guys are some of my favorites due tot he fact that they seem to put a lot of heart into their music. That’s one of the biggest factors of whether I like a band or not; do they write music about things that they care about or do they write music to make money? Look at Justin Beiber, for a terrible example. In my opinion he writes music in order to make money. I don’t like that. Bands like Close Your Eyes wrote their music and performed it because it meant something to them. The band is still around but their lead singer left due to personal reasons. From what I’ve been able to pick up, touring put too much of a toll on his personal life. I can respect that. Anyways, the point of this post is to recommend my favorite song of theirs. You may like it, you may not. Just never say that all religious music sounds the same. This book surprised me. I’ve always really liked C.S. 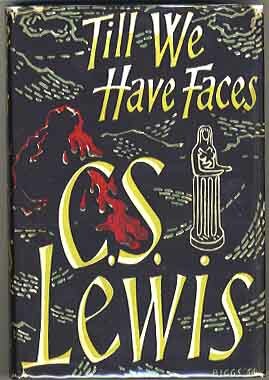 Lewis’ writing, but I had never really heard anything about Till We Have Faces. I picked it up at a book store because it was one of the Lewis books they had that I hadn’t read. It took me a while to get around to reading at and when I did I found that I had a new book to put into my list of favorites. C.S. Lewis takes the classical myth of Cupid and Psyche and weaves a new tale set from the point of view of Psyche’s less than beautiful sister Orual. The tale is set in a sort of barbaric and primitive culture of the city-state of Glome. Glome is in contact with an area that is more like classical Greece and has been receiving different ideas and individuals from there. This influence leads Orual to go one a journey of her own in order to find her own truth. If you like classical myth or if you like the writings of C.S. Lewis then I would highly recommend picking this book up. I’ve made the mistake of pretty much spoiling things that I’ve recommended before so I’m going to purposefully keep this short. This book has my recommendation and that’s all you need to know. Alright, so this one is going to probably be laughed at. Nevertheless, this is my blog and I do with it what I wish! This week I’m recommending The Bigfoot Show podcast. Why, you might ask? To be frank, there’s a whole lot of bad information out there on the topic of the Sasquatch. A majority of people do not think that Bigfoot exists or even could exist. The problem is that most of these people are uninformed. They get their info on the topic from Finding Bigfoot and other very respectable sources of scientific research. The more fringe elements in the Bigfoot world make crazy theories and try to pass them to the public to accept as the mainstream. One thing I love about The Bigfoot Show is that the hosts never say that they’re experts, they just try to approach things from a logical point of view. The main host, Brian Brown, serves on the Board of Directors for the North American Wood Ape Conservancy (previously the Texas Bigfoot Research Conservancy) and has first hand accounts of encounters with the species of apes that the Bigfoot community is trying to prove. For those of you who really don’t know much about Bigfoot, here’s a few ideas to remember. There is more than one. Bigfoot isn’t a lone and solitary beast; it is a species of ape that has a probable lineage in the geological record. There are hundreds, if not thousands, of sightings each year; many of which go unreported. I personally have seen something myself that can only be described and explained by the Bigfoot phenomenon. Call me crazy, but it happened. There is real and serious research going on in this field. The NAWAC itself is doing some extremely interesting research in an undisclosed location in eastern Oklahoma. I will link a below a video taken of a presentation that Brian Brown made during the latest annual conference of the organization to highlight the evidence that they have collected over the last year. If you consider yourself someone who appreciates the advancement of science and wants to try to have an open mind, there’s worse places to find interesting information than The Bigfoot Show. They crack jokes, some of which are inside jokes for the bigfoot community, but they do a good job at judging things logically and scientifically. Educate yourself before you prematurely judge something as impossible. Jane Goodall said that she thought that there was something behind this phenomenon. If Jane Goodall thinks it’s worth investigating then we should all be doing our best to look into it objectively. What makes a great movie? In my opinion it is a combination of several things. A great movie will move me on an emotional level, a great movie will have really good acting that is convincing, and a great movie will have an overarching theme that gives the movie a deeper meaning then the obvious plot. The Grey, a 2011 (majorly released in 2012) psychological thriller by Joe Carnahan, does all three of these things. The Grey, with Liam Neeson in the lead role, is about a group of Alaskan oil workers who have survived a vicious plane crash and must try to find their way to safety. This sort of idea for a film has been done before but The Grey is able to take it further with the amazing performance from Liam Neeson. In order to describe how Liam Neeson does such a good job I’m going to have a s few spoilers but knowing them won’t ruin the movie but read at your own risk. 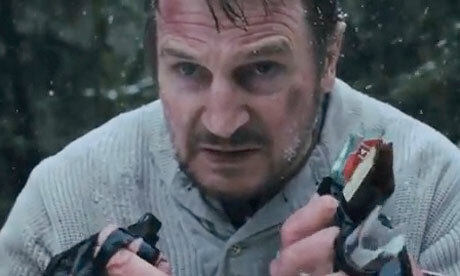 Before The Grey went into production, Liam Neeson lost his wife in a skiing accident. When someone loses someone close to them there’s no real way to really know how their feeling. 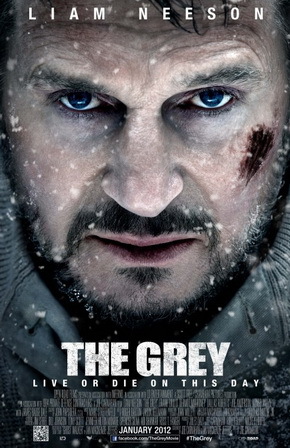 The Grey, however, gives us a glimpse into Liam Neeson’s soul. Ottway, Neeson’s character, is going through a deep depression due to the loss of his wife. We see him at the beginning of the film write her a letter before attempting suicide. The pain in his eyes is clear and a part of me felt like Neeson wasn’t really acting. He was using this role to help channel his feelings towards his loss. As the film progresses and the plan crashes in the wilderness (by the way, one of the most frantic plan crashes I’ve seen in a movie) Ottway takes control of the survivors. The survivors come to find that they’re right in the middle of the hunting grounds for a pack of wolves and members of the party start to die off. As this happens the survivors begin to contemplate their own mortality and on the existence of hope. Some of them have hope and harbor memories of their loved ones, and these memories comfort them in death. Some don’t have hope and just give up. Some have the will to push on and refuse to give up. In the end, only Ottway is left. It is at this point the we discover that his wife left not because of a divorce but because of a deadly illness. This is revealed as it is shown that Ottway has stumbled into the wolves main den and he realizes that his death is imminent. Instead of breaking down emotionally, he resigns to go down fighting and to make the last moments of his life have value. Then we see the scene that everyone saw in the trailer where Ottway ties some of the mini bottles of alcohol from the airplane onto his hands in order to break them so that he has a weapon. Then, the alpha wolf that had been trailing him the whole movie charges his. Before they meet, however, the screen blacks out. We don’t see the fight. I know there was some people who were mad that we didn’t get to see the fight because the movie was sort of portrayed to be a Liam Neeson vs. Wolf film from the advertisements. However, The Grey is about so much more than that. The Grey is about having hope, cherishing those you love whether you still have them or not, and that every life has value and should never be wasted. If you haven’t seen The Grey than I highly advise you to go rent it or to buy it. The Grey was one of my favorite films of 2012 and will be one I’ll keep in my collection for years to come. This friday, June 15th, is the return of Red vs. Blue with the start of season 11. Therefore I thought it would be fitting to have the show as my recommendation for this week. Most likely, if you’re reading this, you already know about Red vs. Blue but I can’t assume that. 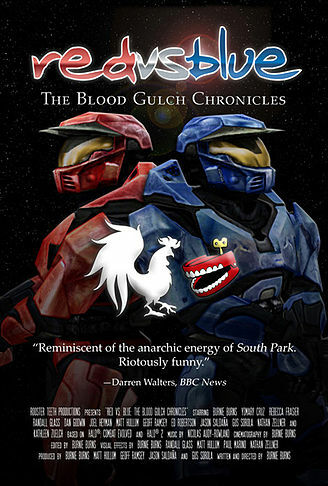 Red vs. Blue is a machinima production that was started by Burnie Burns of Rooster Teeth Productions. Red vs. Blue has pretty humble origins. Burns, along with Gustavo Sorola and Geoff Lazer Ramsey (that’s his real middle name), worked on a video game review site called Drunk Gamers. They were tasked to do a review for Microsoft’s Halo: Combat Evolved and different recordings were done of gameplay for the review. Burnie Burns decided to put voiceover to the recordings, and from there Red vs. Blue was more or less born. Red vs. Blue, as of now, consists of 10 seasons that can be split into 3 story lines. These stories are connected, however, and all seem to come to a close in the end of season 10. The show begins as a comedy and transforms into a comedic drama as more characters, story arcs, and the technology used in recording the show changed. The team at Rooster Teeth brought in animator Monty Oum at the beginning of season 8 and this has garnered different reactions from fans of the series. Most fans, myself included, think that the animations give a degree of respectability that the original show would be hard pressed to achieve, as well as make more story elements possible to pull off. I am purposely being light on the story of Red vs. Blue because, even with its humble origins, becomes a pretty engrossing tale. The first few seasons can start off slow to those who view themselves as more cultured or are more judging than the average viewer, but it is definitely worth it to keep watching. Break out the Redvines because his week I am recommending one of my favorite television series. Fringe was a television show that focused on the people of the Fringe Division of the FBI. Their mission statement is to investigate phenomenon that could not be immediately explained. This premise for a TV show is pretty decent enough, and the first season of Fringe is decent. However, the show comes into its own when it starts mixing timelines and invaders from the future. Add in the dynamic and always entertaining acting of John Noble and you have a show that may not of had a large audience but had a devout cult following. I was lucky enough to discover the show in its third season. I powered through the previous seasons online and fell in love with it. Over the last several years my television seasons had been dominated by when Fringe was either on or when it was supposed to come back. The relationships between the characters and the continual progression into a bigger and bigger threat led to a story that I thought was very entertaining to witness. At the end of the fourth season, however, Fringe ran into a problem. Fox is known for cancelling shows due to low viewership and Fringe was put on the chopping block. However, unlike what happened for Firefly, the executives at Fox decided that Fringe deserved a proper ending. The show writers had an endgame in mind in case something like this happened so Fringe got the end it deserved in its fifth season. 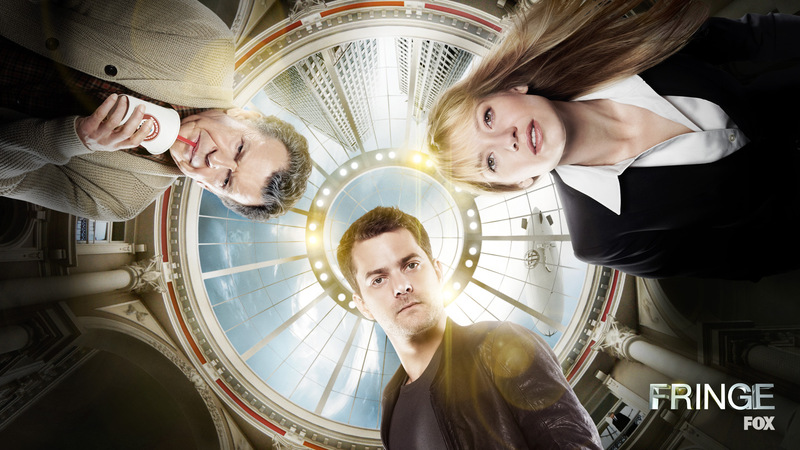 If you appreciate good television with great actors and a deep story, give Fringe a try. Airings of the show can still be found on the Science Channel, I think, and most of the seasons are available for purchase and streaming online. The first season can be slower to get through, but if you keep up with it Fringe becomes more than another mass-produced drama.